he promotion of healthy living by the government of Ontario has a long and fascinating history. From busy public health nurses to today's Ontario Ministry of Health Promotion, the government has always tried to help Ontarians live longer, healthier lives. The Archives of Ontario has many holdings that detail the activities of the government agencies that have been involved in the promotion of healthy living in the province. 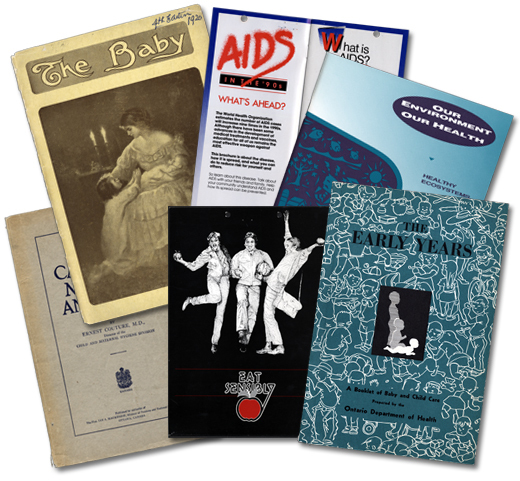 From correspondence, reports, and photographs to booklets, posters, and films, health promotion in Ontario has taken many forms. As attitudes toward health promotion shifted through time, so did outreach methods. 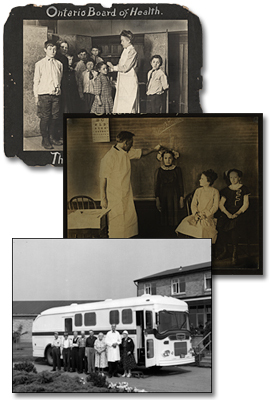 Early public health nurses traveled the province in retrofitted Model T Fords, and by rail to remote communities. And the message of healthy living continues to be delivered in person today: public health nurses still visit children in schools and new mothers at home, using new communications technologies. This exhibit highlights the increasing sophistication of health promotion in Ontario, with many campaigns borrowing techniques from advertising, public relations, and market research to influence people’s behaviour. The history of health promotion in Ontario is also, of course, the history of the health of Ontarians. From tuberculosis to SARS, the approach to encouraging healthy living has changed as needs have changed. This exhibit was made possible through a grant from Associated Medical Services Inc. (AMS), an organization dedicated to the history of medicine and healthcare. The Archives of Ontario gratefully acknowledges AMS's contribution. The Archives of Ontario would like to thank Carol Anderson, curator of this online exhibit.